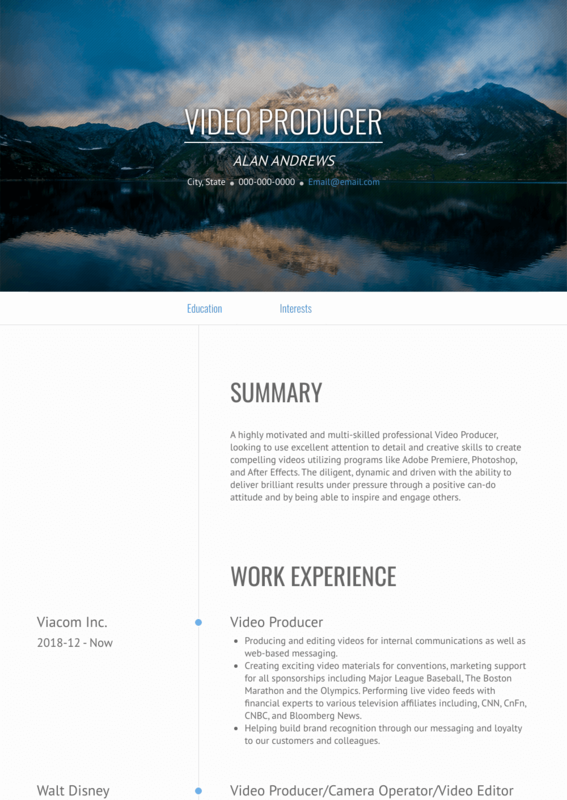 This page provides you with Video Producer resume samples that you can use for inspiration in writing your own resume, or for creating one through our easy-to-use resume builder. Below you'll find our how-to section that will guide you through each section of a Video producer resume. Video producers are currently in great demand. Moreso, excellent, highly skilled and professional video producers like you are quite unique! Don’t get too confident though, a great resume is still needed, especially considering how competitive this industry has become over the last couple of years. Producers don’t just call the shots but have a lot of responsibilities resting on their shoulders and in a sense they have to work hard twenty-four-seven. So, if you were looking for a standout video producer resume sample, well, look no further! We have the ability to help you create a simple but effective resume that grabs your future clients’ attention all around the world. We have succeeded with millions of users and we want the same for you: get the job you have always dreamt of now! How to Write a Video Producer Resume? Resumes look harder to complete than they are in reality: you could easily describe your job in front of your peers, but when it comes down to actually writing your resume...it all looks so much harder, right? Start by listing the basics of your contact information and why you think you’re the best for the specific position you are applying for. Ask yourself what are your best traits and make sure you showcase them all over your resume: do not sell yourself short! In terms of the format for your resume, we strongly recommend the reverse-chronological order format. Why go backwards instead of listing your latest career highlights first? It’s purely down to the fact that employers want to see the most recent highpoints of your career as this is what you’ve done more recently. Once you consider the way you present the resume, ideally, you want a nice format which is clean and full of white spaces! That might sound strange to you, but employers want to be able to read a resume without feeling overwhelmed with information. Oh, and don’t forget to save your resume as a .pdf file. We have got nothing against Microsoft Word, but most times, it does heavily affect the layout of your resume. - Showcase your tech skills. - Use a neutral tone throughout. DON’T (Summarize your life) - Keep cramming in information. - Have spelling mistakes. - Use broken English. Video producers usually have worked on numerous projects in the past and a selected few could be added onto your work history. Remember, employers want to see nice work history, especially if you’ve been in the business for many years. Of course, you don’t have to list every job you’ve had as a video producer but rather the ones which standout the most. Most times, starting from your latest role and working your way back can be more useful and easier to remember as well. Of course, if you’re new to the producing world, don’t fret if you have limited work history, you could add on any unpaid work as a video producer. Try to keep your work history honest and to the point. Do (Summarize your work history) - Explain what skills or talents you have suited for the producing industry. - Try to include information which relates to producing. - Cut down on the information you provide. For more tips on writing the best work experience section for a video producer like you, check out our detailed resume guide. The number of years you’ve studied to become a video producer. Which schools you studied with. Creating a simple piece of education history can be easy enough and will be an added value to your job’s application! Video producers like you have lots of skills that get used on a daily basis - offer your future employer a simple run-down of what you’re capable of, but don’t include them all! Take some time, brainstorm with yourself (or even with your peers) and come up with a short list of the best skills you believe are crucial to video producing and perfectly fit the job you are applying for. Don’t worry too much if you aren’t sure what those skill are, we can help you to make this a lot easier, just check this out! DON’T (embarrass yourself) - Use an unprofessional picture - Use references which aren’t useful to you. - Use overly bright colors. We have given you tips for the best video producer resume sample: now, if you are also looking for the effective video producer resume templates, you should check this masterpiece we have been worked on [LINK to https://www.visualcv.com/cv-templates/] : many professionals like you have successfully used it to take their career to the next level.